The problem: keeping track of rushes, draft versions and final edits; making sure that everyone follows the agreed project specification. Case study: Widgets Ltd needs a promotional video for their new exciting range of.... widgets. You share a Beamshare folder containing your showreel, your pitch and your general terms and conditions. The client loves your pitch and gives you the contract. You add the project specification and filming schedule to the folder. The client gets an automatic notification and you can check that they've actually read the spec. Upload rushes to the folder during or after the shoot. The client views and selects footage for the promo. 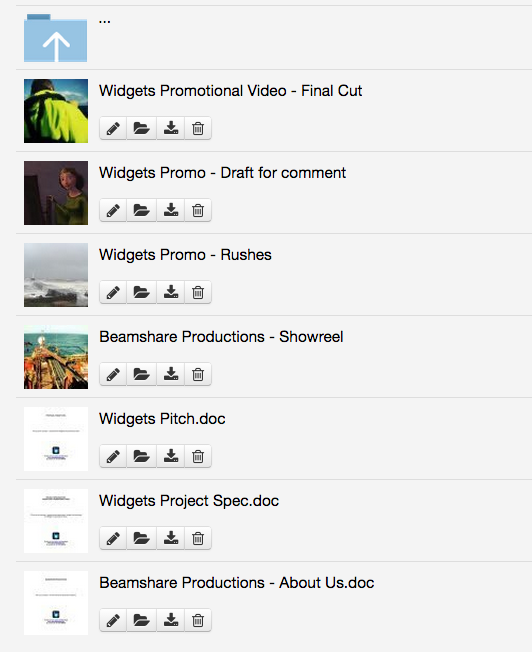 Upload a draft edit and get detailed feedback from the client using Beamshare's super-easy user interface. Send the client the final cut. Everything is handled in one folder, so it's easy to keep track of what is going on. It's convenient and easy for your client and it lets you organise and finish your project quickly and efficiently. Try it for yourself - register for a trial account and experience faster, easier workflows.